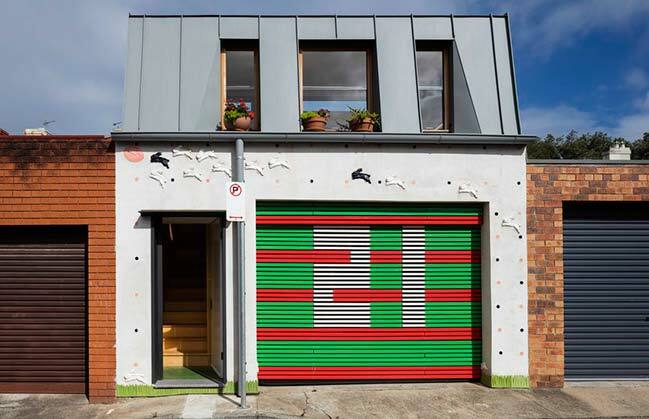 The project is like a case study for a Laneway Studio or Garage-Top dwelling. As the need for density and intensity of use grow, the 25sqm footprint is an important sustainable model for the fine-grained pedestrian city. In doubling the height of existing frontages and adding another layer of use along it’s length, this building type has the potential to positively transform lanes towards the qualities of our best streets; active, connected and urbane places. 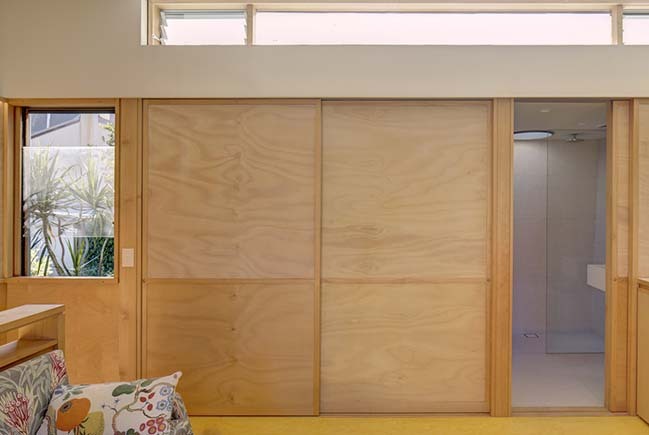 From the architect: We wrote our own brief, which was to provide a better model for a laneway studio type, which are increasingly being built in growing numbers along many of the lanes around metropolitan Sydney. It was on one level a NIMBY like reaction to the generally poor quality outcomes that are the result of poor planning guidelines and poor quality architectural design. 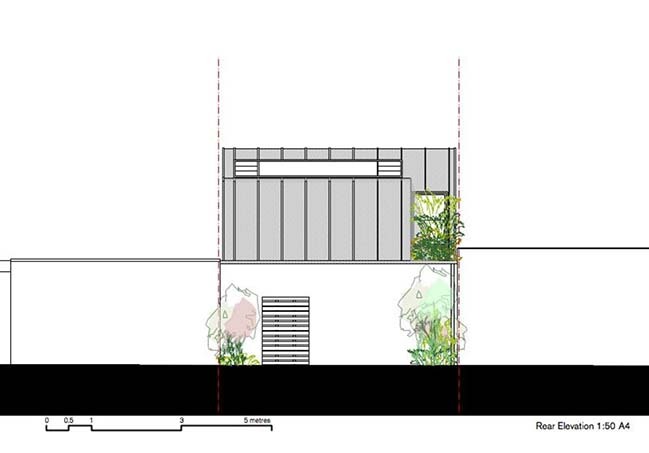 Driven by both personal and public interest we have developed an alternative model for the laneway-studio type. 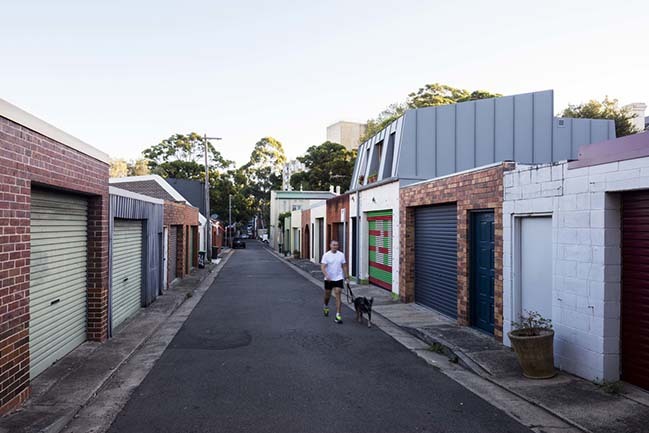 Urban Context - The laneway studio is a small project in itself, however when seen as a type, multiplied across 100s of lanes across the city it becomes a large urban project. 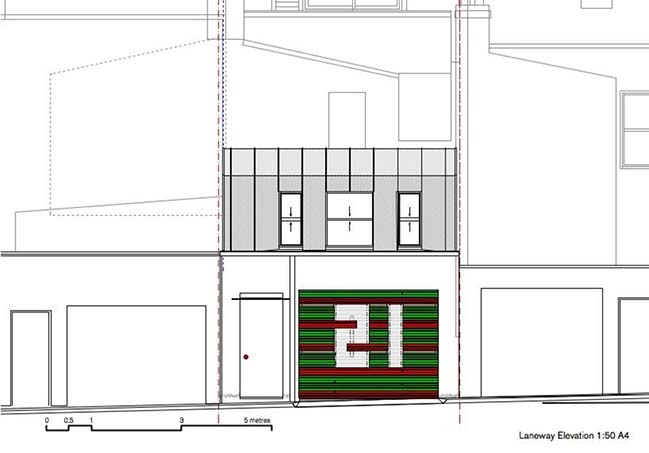 Doubling the height of existing frontages and adding another layer of use to a service lane transforms the lane imbuing it with the qualities of a street. As the need for density and intensity of use grow, the 25sqm footprint is an increasingly important model for the fine-grained pedestrian city. 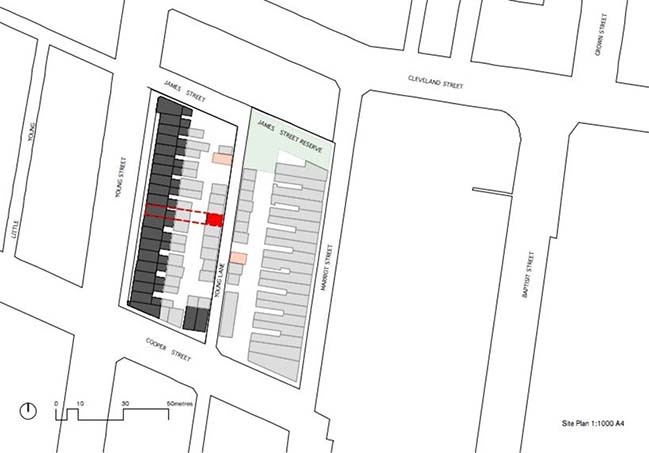 A study of many inner-city neighbourhoods showed the vast majority of laneway studios create a range of issues including, inadequate passive surveillance, privacy conflicts both public and private, unnecessary bulk and overshadowing to neighbours, a non architecture outcome due to council’s “fear of urban form” and inadequate internal amenity. Key Challenges - To subvert the council norm to create a new and better model. 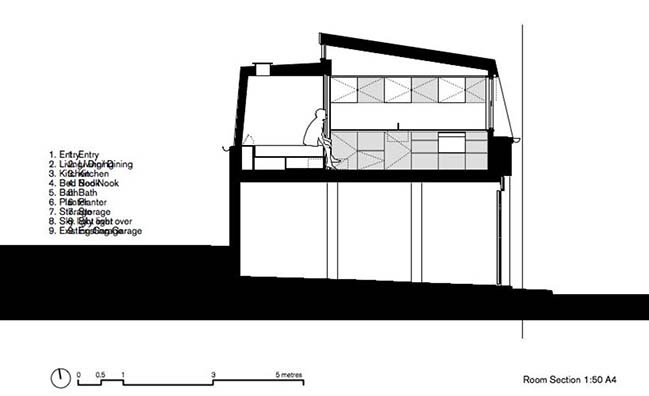 Council are encouraging an “Attic Roof form” with a dormer window. The attic roof so constrains the plan and volume that the dormer becomes a perversion of it’s type stretching from ridge to floor. Council should instead be looking at 3 controls. Be a good Citizen- The zero-setback line and small size of the dwelling means there is a dramatic intimacy of scale between the public and the domestic. The relationship must be at once both defensive and engaging, affording passive surveillance, whist enabling privacy. The design of the window as the interface between the two scales is fundamental. 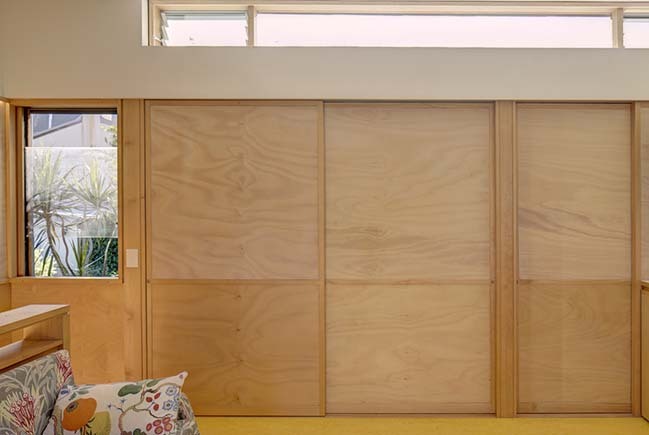 Sills above 700mm, deep and angled reveals, exterior blinds and or shutters are all part of the toolkit. 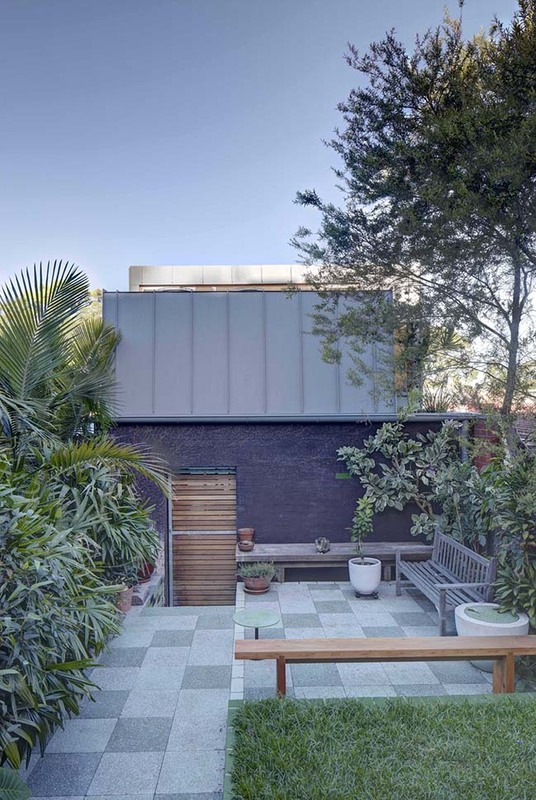 Be a good neighbour- At the rear, the terrace house yard, becomes more court like. Issues of bulk, overshadowing and privacy are critical to the 3 (court) yards adjacent to the development. 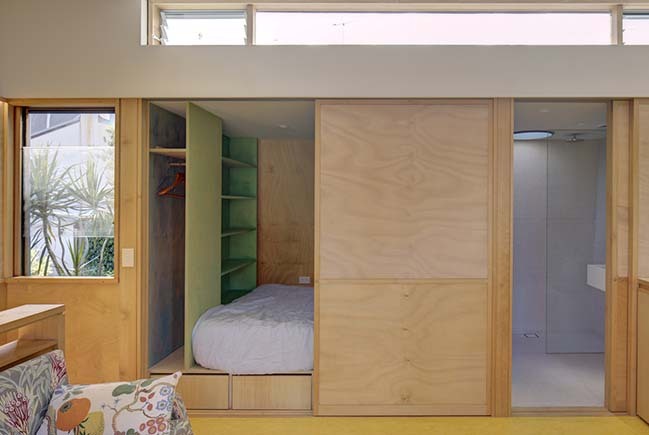 Maximise internal amenity-space, light, air + privacy. 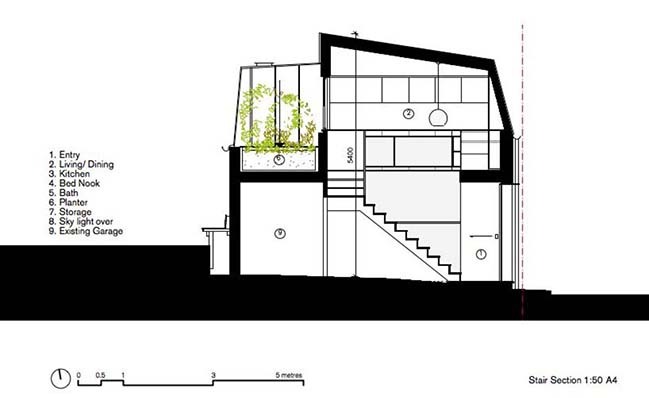 Solutions - In negotiation with council, a mansard roof form to the lane enabled us to build boundary to boundary, placing the bulk of the volume on the lane. 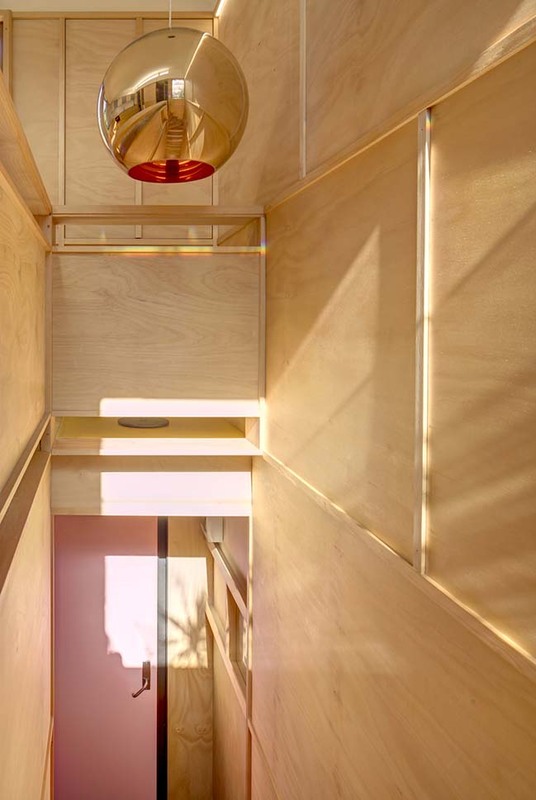 The layout of the stair is critical in the set out of the plan as it articulates the larger volume to the street and the lower volume, containing bathroom and bedroom nook to the rear. 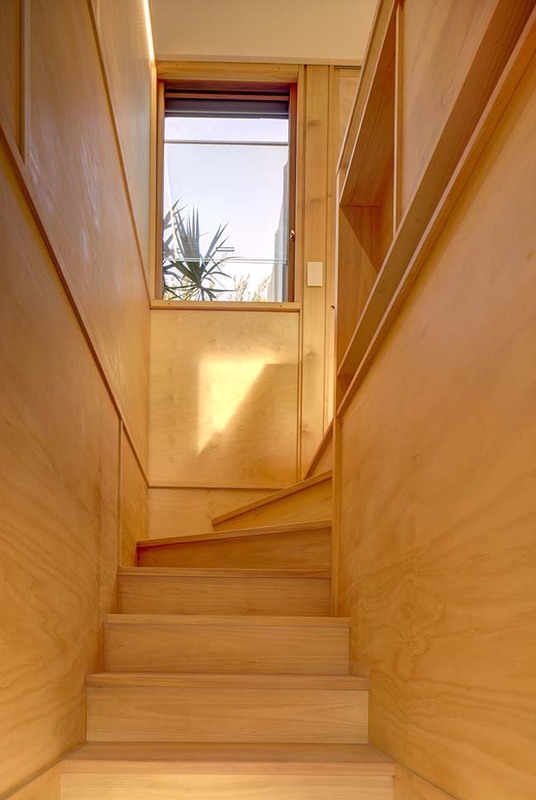 At the top of the stair the volume is completely removed, further reducing overshadowing for the southern neighbour and allowing a window at the top of the stairs and set well back from the rear. 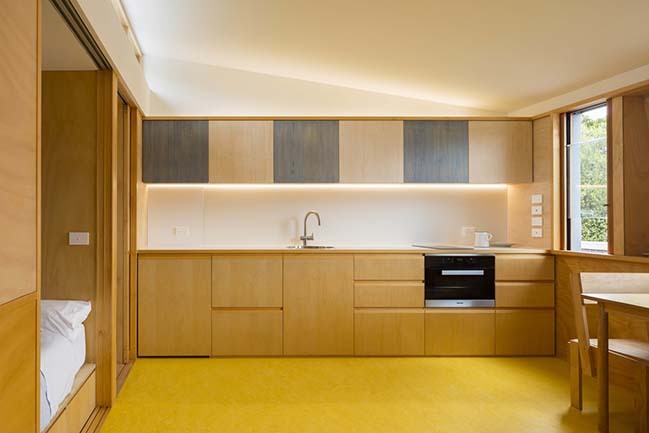 The tight efficient plan enables a living/dining kitchen room to overlook the lane, under a higher cross ventilated volume; a bedroom nook and bath that open and shut down to it. 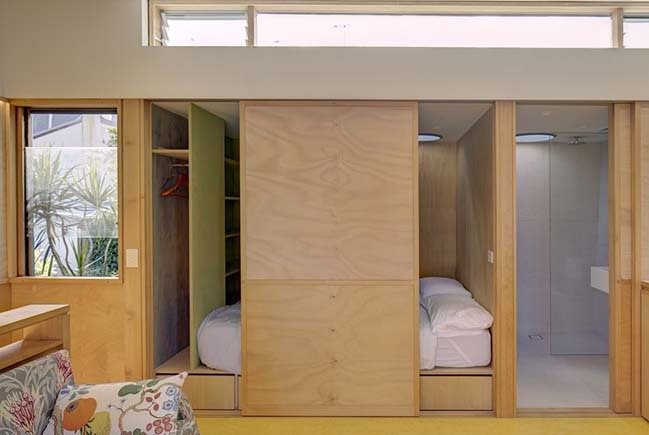 Storage is integrated throughout, under, behind and beside the nook. Materiality - An aluminium standing seam was used as a robust and unifying treatment for the entire exterior, including walls, roof, guttering and downpipes. 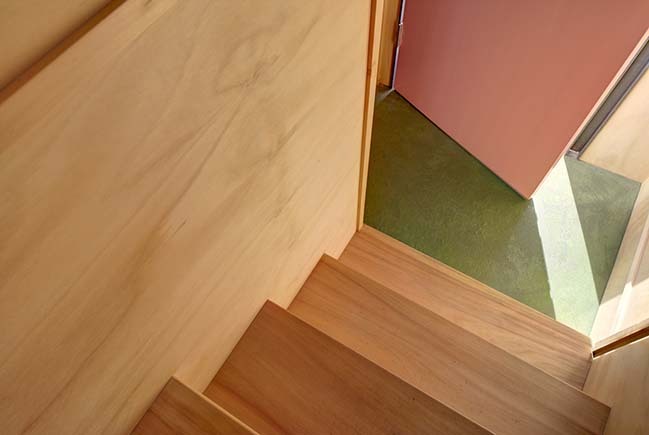 We wanted a similar unifying material for the interior that would be warm, robust, environmental and enduring. 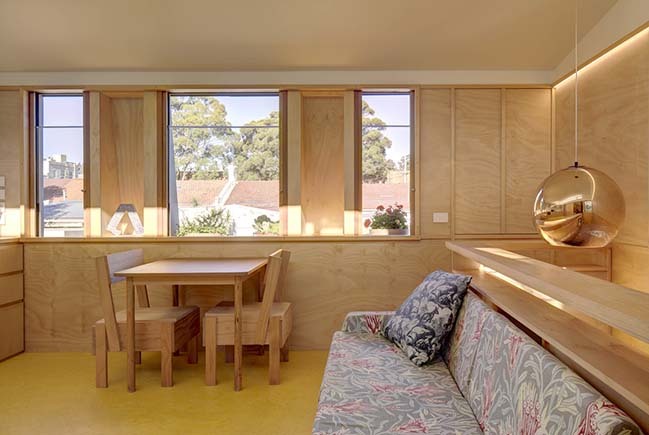 Australian Hoop Pine, with it’s warm honey colour met this brief, and further it’s range of products, including solid sections, plywood and veneer panels, enabled us to design the interior, (including the stairs, wall linings, joinery, sliding doors and sills, heads and cover strips), as a unified harmonious whole. Several coats of Synteko’s Rubio Oil was applied with a rag and rubbed off. Artist’s pigments, including white, green and blue, were selectively mixed into the oil, to subtly articulate and highlight particular elements or spaces. 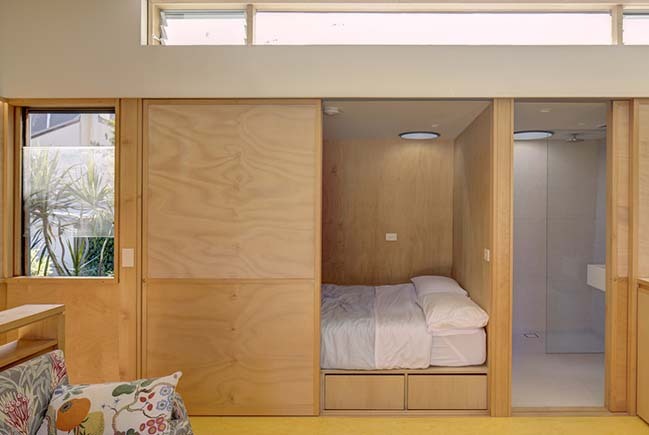 Cost/Value Outcome - This type is very economic; no footings, lightweight structure, yet providing 25sqm housing for 2 people. 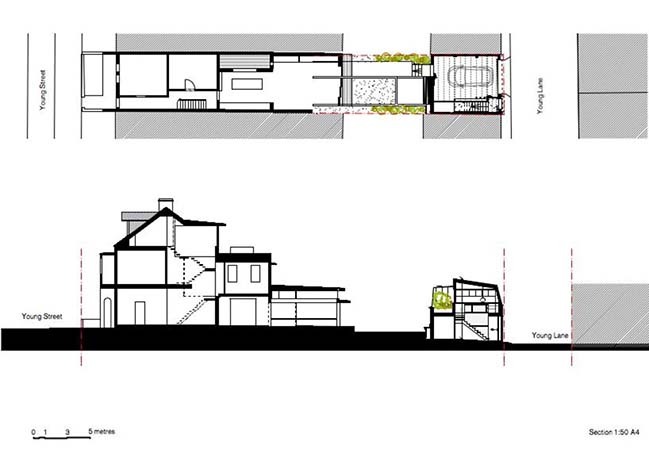 Response to Client and User Needs - In the mediation of bulk and privacy to the rear and the additional life on the lane, the development absorbs density, whilst transforming the service lane into richer more complex urban place. 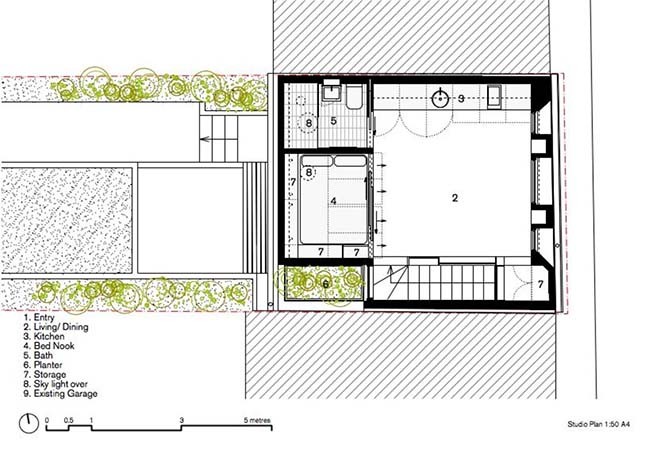 • The plan creates a very efficient footprint of 25m2, suitable for 1 or 2 people. 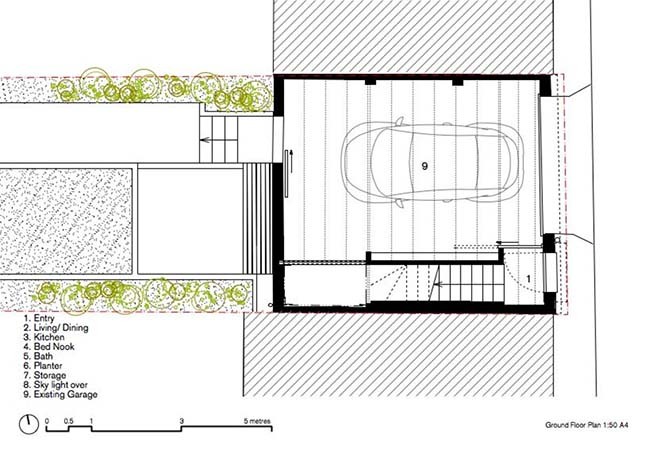 • The section works on several levels further layering the efficiency of the plan with storage, nooks, serving and served spaces. • The project is located in an area of the “walking City”, providing easy access to high quality local amenities including, parks, pools, shops and restaurants, as well as good public transport and places of employment. • Windows to the east and west, in a shallow plan, provide cross ventilation and ample sunlight, controlled by exterior blinds. • All lights are LED. 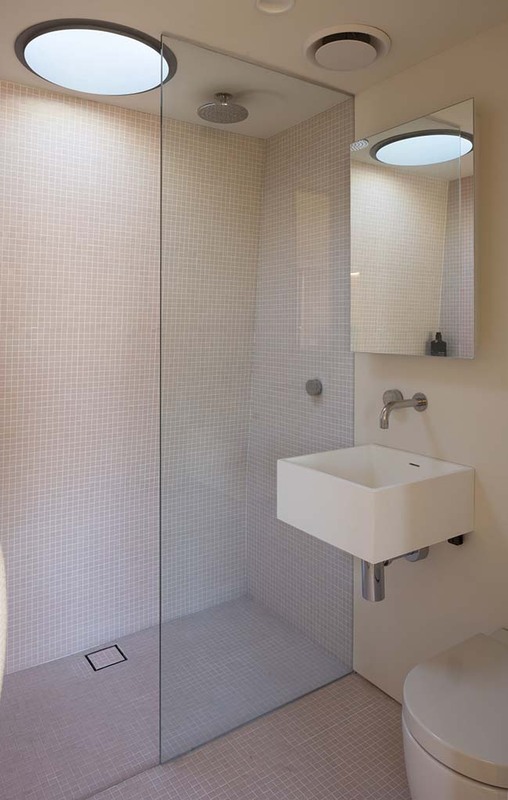 • Materials have been chosen for their enduring, inherent, integrated or factory finish. 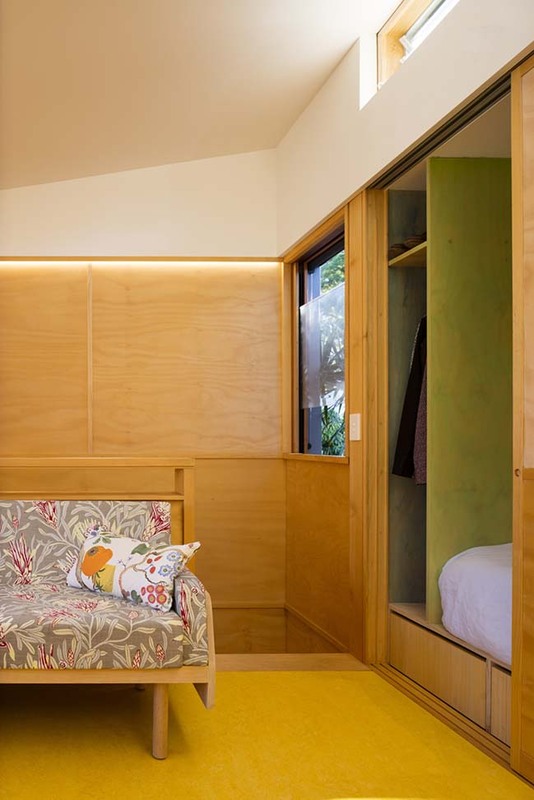 ie The main interior cladding is Queensland hoop pine ply and solid sections, from managed forests. The floor is linoleum (made up largely of linseed oil). • There is no air-con.